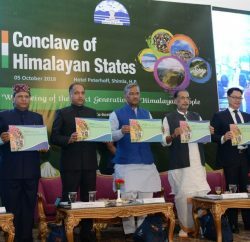 The Himachal Pradesh Government hasn’t framed any norms for determining the fee structure proposed by the private universities, the Comptroller and Auditor General (CAG) report revealed. CAG in its performance audit to ascertain the standard of higher education and regulatory mechanism governing functioning of the universities, tabled in recently concluded Vidhan Sabha session revealed the fee structures proposed by Private Universities were being approved without considering costing elements such as operating costs, nature of courses, cost of fixed assets, reasonable surplus required for growth, etc. Analysis of data on fees charged by the test-checked universities for a particular course (B.Tech.) showed that Bahra University, Chitkara University, and Jaypee University had increased their fees by 21, 23 and 58 per cent respectively (for 2017-18 as compared with 2016-17) without any justification. This resulted in arbitrariness in charging of fees, the report said. The state has 17 private universities established from 2002 to 2014. The CAG has found the state government hasn’t made any need assessment before setting up private universities in the state, and 17 Private Universities had been established of which 10 were located in one district alone (four in one Gram Panchayat). The State Government hadn’t prescribed any norms for assessing the financial soundness, expertise and potentiality of the courses proposed by the sponsoring bodies leading to arbitrary and non-transparent decision-making, CAG further revealed. Fifteen private universities were functioning in the State with faculty not possessing minimum qualifications especially in the Professor (22 per cent) and Associate Professor (28 per cent) levels. Shimla based APG University has maximum number of 52 under qualified teaching staff. APG has 9 professor, 14 Associate professor and 29 assistant under qualified professor. The University has recently claimed of highest numbers of admission in various courses. There was significant shortage of faculty in private universities, particularly in the Professor (38 per cent) and Associate Professor (61 per cent) levels. Thus, 10 of the 17 private universities were located in the seventh-least, pre-university completed populous district, i.e. 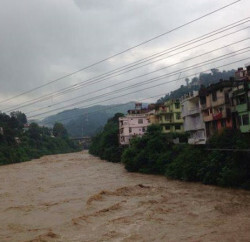 Solan (four were found to be located in the same Gram Panchayat), while a total of only six private universities were located in the five most populous districts. Only one private university was located in other six least populated districts. Further, it was noticed that there was total enrolment of only six per cent during 2011-17 in certain courses in two out of the ten private universities located in Solan district, indicating that demand for these courses in these universities was low. UGC has specified the nomenclature of degrees that can be offered by universities and mentioned that the universities shall not introduce any new nomenclature for degrees. A university intending to introduce any new nomenclature for a degree must seek prior permission of the UGC. Audit noticed that Shoolini University of Management and Biomedical Sciences was running (2014-16) two unspecified courses namely M.Sc. (Honours), Biotechnology and M.Sc. (Honours) Microbiology without seeking prior approval of UGC. Since the nomenclature of these courses was not approved by UGC, it was not clear whether the degrees awarded to the students who had completed these courses were valid. The High Court of Himachal Pradesh had directed private education institution not to charge fees towards building fund, infrastructure fund, development fund. Audit scrutiny, however, showed that three of the nine test-checked private universities had charged Rs. 4.58 crore on account of “Development Charges” during 2016-17. On the time of admission, most of private universities charged security money (refundable on the time of completion of the course), but Audit found that four private universities had not refunded security money amounting to Rs. 2.89 crore to 2906 students passed out between 2012 and 2016 as of March 2017. CAG report confide that the Registrar, Shoolini University stated that the students had not applied for refund of security money. The reply is not acceptable as the responsibility to refund the security money rested with the university and not the students, report further said. State Government guidelines prescribe that the project report of the sponsoring body for establishment of a private university must contain details of research proposed to be undertaken by the university and its relevance to the development goals/ needs of the State. 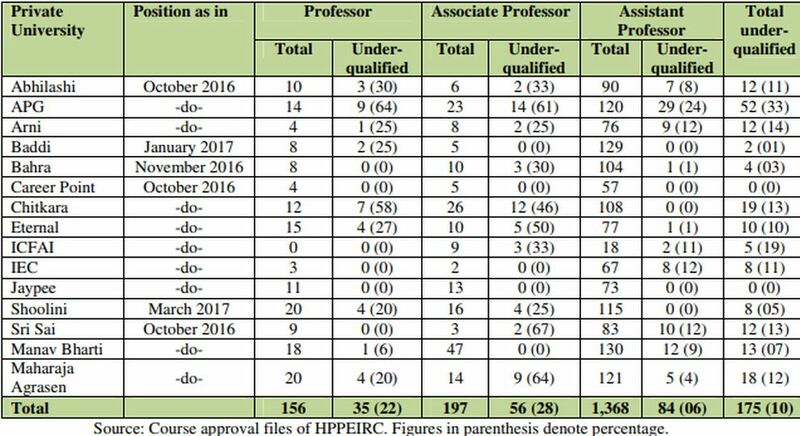 Audit scrutiny revealed that 352 Ph.D. candidates had been enrolled in only four out of the nine test-checked private universities. 67 research projects had been undertaken with GoI/ State Government funding of Rs 17.00 crore in these four private universities, of which 32 projects had been completed after incurring an expenditure of Rs. 5.25 crore while 34 projects were lying incomplete after expending Rs. 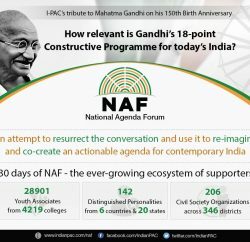 4.15 crore and one project had been abandoned. CAG found that the Private Universities aren’t emphasizing on conducting research work, and not adhering to the proposals submitted by them at the time of seeking approval for establishment. The CAG has also raised question over the examination systems adopted in the private universities as it found that most of the Private Universities haven’t external evaluation to assess students as in the case of colleges affiliated to a university where question papers are set and answer scripts are evaluated independently by the university. Thus, HPPEIRC had not been able to ensure good standard of question papers and evaluation of examination papers in private universities, as was required by rules, report further revealed. The Private Universities are also bound to give Provident Fund for its employees. However, scrutiny of records showed that eight out of the nine test-checked private universities had not enrolled employees ranging between 140 and 1,075 during 2008-17 for the EPF scheme, thus depriving these employees of the social security benefits to which they were entitled. It was also found that although Arni University had deducted employees’ contribution from salaries of employees, this amount of Rs. 38.60 lakh for the period October 2015 to March 2017 had not been deposited by the university concerned with the Commissioner, Provident Fund, Shimla. According to a provision contained in the respective Acts establishing private universities, the General Fund constituted by every university shall be utilised for, inter-alia, payment of gratuity and other benefits to employees of the university. Audit, however, noticed that none of the nine test-checked universities had made any provision for payment of gratuity to its employees. The Registrar, APG and Shoolini University stated that the university was in the process of making a provision for General Fund for making payment of gratuity to its employees. There was acute shortage of manpower in the Regulatory Commission, which was reflected in large shortfalls in conducting inspections. 1394 courses in private universities during 2011-17 had been approved by the Regulatory Commission without conducting inspections to ascertain availability of infrastructure and staff. The State Government had sanctioned 28 posts (of different categories) for the Regulatory Commission. Audit observed that there were persistent vacancies in various posts. It is found that vacancies in the posts of Member, Advisor and Law Officer were persistent and have adversely impacted the ability of the Regulatory Commission to discharge its responsibilities.